Food, air, and water are the sacred triumvirate that allows life to happen. These elements are vital to survival. But food serves a more complex function. It also can be used to provide enormous pleasure and legitimate comfort. When used to excess, however, the evidence of this overindulgence can be striking and unhealthy and is often linked with obesity and shame. Having personally and professionally experienced years of my own anguish and that of my clients, I chose to title my book Immaculate Consumption because I believe it provides science-based guidance at the critical moment of consumption when taking complete responsibility for what you choose to put in your mouth is absolutely vital. For me, this moment is almost sacred and represents the cornerstone of my methodology. 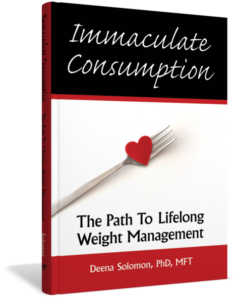 Immaculate Consumption© examines the dynamics of a highly effective and scientifically proven weight loss methodology and provides the reader with an accessible and easy-to-understand and easy-to-master system that makes sustainable weight loss attainable. The system represents a major paradigm shift in the field of weight reduction. The selected program should provide a systematic method for “recovery” from the illness. After the “sickness” is cured, everything must be done to prevent relapses. In the world of dieting, obesity is thus considered a “disease” that must be healed, and the weight loss industry has lavishly benefitted from this perception. Commercially marketed diets exploit a core concept that has been foisted on overweight individuals, one that perpetuates feelings of humiliation, shame, and embarrassment about the inability to regulate their food intake. Our culture has created the belief that if people would only acquire willpower and self-control, then they would not have a weight problem. If you’re fat and have failed to lose weight and/or maintain your weight loss, you probably have bought into this idea. I certainly did for almost 30 years, and the majority of my patients during my subsequent more than three decades of clinical practice have described identical feelings. Immaculate Consumption© furnishes a self-help program for life-long weight loss and weight management that celebrates the uniqueness of the individual. Beginning any weight loss program requires motivation to achieve a goal (which I call “Stage One”), but the Immaculate Consumption Program goes far beyond other diets in its overall emphasis on permanently altering eating habits and enhancing your personal responsibility for your eating choices and behaviors. Because every commercial diet, in essence, considers being overweight an illness, these programs rely on rigid rules and restrictions to break the “addiction cycle” and avoid relapses (i.e., episodes of “falling off the wagon”). This is the same core methodology used legitimately and effectively in the treatment of drug or alcohol dependency. I contend that unlike drug dependency, acquired deleterious food habits are in a completely different category and must be dealt with differently. In stark contrast to protocols commonly used to treat addiction, the methodology advocated in this book utilizes a “minimal intervention” approach that makes the sequential transition from the development of one key beneficial eating habit to another seamless and almost inconspicuous. Immaculate Consumption© teaches readers to collect relevant data and become their own “Single-Subject Researcher” (Stage Two) so that they can determine how best to accomplish their personal weight loss goals, given their own particular idiosyncrasies. In Stage Three, readers learn the one vital cognition that prepares them to recover from inevitable regressions. This cognition is derived from principles of classical and operant conditioning, whose powerful dynamics the brilliant Russian psychologist Pavlov first explored in the early part of the last century, led to titanic shifts in the field of behavioral psychology. Ultimately, this one core principle, which Pavlov meticulously described and scientifically proved (and for which he was awarded the Nobel Prize), has been shown to create reinforcement schedules and constructive habits that can quickly become permanently embedded and can become even more powerful than the immediate gratification of the most enticing food cravings. Enduring weight loss is realized during this maintenance phase of the program. The dynamics of this stage are examined and presented comprehensively and systematically so that they can be completely understood, fully integrated, and proactively applied. Breaks the traditional association that links periodic regressions with failure. Helps readers learn the steps that they need to take to recover from a regression. Presents and examines affirming case studies derived from my clinical practice. Assists readers in creating their own treatment plan so that they can become independent and more effective problem solvers and analysts of their own behavior. Avoids the trap of making dieters into “passive recipients” who are encouraged to put their fate in the hands of coaches, trainers, and physicians that virtually guarantee failure. Provides simple training procedures designed to deviate from conventional dieting-type behaviors and habits while applying the principles of learning theory. Engineers a success at the onset that is sufficiently powerful to prepare the reader for the predictable regressions that will inevitably occur. Decreases the frequency and emphasis of using food as a reward. Provides easy initial assignment with immediate, gratifying results that reduce anxiety and non-compliance. Acknowledges the need for external guidelines (i.e., the scale) during the initial stage of a weight loss program. Encourages readers to identify the feelings, thoughts, and behaviors that are embedded in daily life and their counterproductive eating habits. This book is a gift to anyone who reads it! It provides the most effective approach to weight loss that I have ever experienced. It enabled me to lose forty pounds and gave me the tools to maintain my new weight. A vital component of its approach is the ledger in which eating is journaled, thereby producing invaluable feedback. Out of this feedback come insight, changes in eating habits, and a path to truly successful and permanent weight loss. This is a unique book that is certainly well worth the read! Through her program, Deena enabled me to feel in control for the first time. She taught me how to include the foods that I love the most and give up the ones around which I had difficulty controlling myself. One of those foods was chocolate. I never thought I could give it up, and yet chocolate has not touched my lips for the past twenty-three years, and its absence does not bother me at all. Deena gave me the confidence to feel free from the monkey on my back—food. I finally set aside the constant anxiety as to whether today would be a good day or a bad day. Through the program, she enabled me to keep track of what the day would be, to plan it, to control it, and not to deprive myself of the things I loved. I am sixty-eight years old and look better than I did in my forties. I owe a huge debt of gratitude to Deena. All the people I have referred to her have benefited from her program. She can tell within one month if you will be among the 85 percent of her clients who succeed. I was fortunate to be one of them. Thank you, thank you, thank you, Deena. Deena’s demeanor is what initially gave me hope. Hope is mostly what I needed at first. She was direct, assertive, strong, and clear, while still maintaining a sense of warmth and nurturing. In our first session she explained to me, in concrete scientific terminology, that behaviors were only that: behaviors. They are choice. With attention, awareness, and some practice, they can be replaced. I love you and hope to work more with you in the future.